Comprising of three bedrooms and three bathrooms with designer touches, this cottage has the wow factor! Very much enjoyed this attractively furnished and comfortable cottage in a beautiful natural landscape with walks from the door.. Owners who lived next door very friendly and helpful. Public footpath came past the cottage, but only occasionally used, so not for anyone seeking complete privacy. I couldn’t wait to leave my review to tell everybody how much we fell in love with this cottage. Upon arrival I just knew the next 9 nights was going to be brilliant. Loved everything about this cottage, the walks the views and needless to say we were very sad to leave. Barbon is a very special little place. We would also highly recommend The Barbon Inn, excellent food,excellent staff and could’ve find fault with anything. Really enjoyed the stay. Was ideally placed for Kirkby Lonsdale and Kendal and the cottage had everything we needed. Once over negotiating the initial crawl along the narrow access road we had a really good week in an excellent cottage, became very adept and confident by the end of the week though as we went back and forwards each day to enjoy the surrounding area. Enjoyed the easy walk to the great pub in Barbon during the daylight though somewhat daunting to return in the dark! Thanks to Park House Cottage, Millhouse Cottages and Kirkby Lonsdale, hope to see you again soon. This really is a very special cottage in a truly breathtaking area. The cottage was spotlessly clean and decorated tastefully throughout. We found it to be very comfortable and welcoming. It is set in a fantastic location with stunning views all around. Waking up to the peace and tranquility and beautiful scenery was a pure joy every morning. Its very close to the lovely Kirkby Lonsdale which has some great places to eat and walk. The Highwayman at Nether Burrow is well worth a visit for good food and friendly service. We will certainly make a return stay at Park House Cottage. Very comfortable cottage, great location and would be very happy to return again with the family to explore the area even more in the future. The cottage was lovely and the views amazing. Very Relaxing. Sad to leave and can't wait to go back. Beautiful Cottage in enviable location. The cottage was comfortable and well equipped and was within easy access of the village. Great views. We'll be back - cottage is in the most stunning, peaceful location right under Barbon Fell. Close to Barbon village which is really lovely, with pub and community shop. Cottage beautifully decorated - but instead of lots of nick nacks, would have preferred better basic cooking equipment and more spare plates/cutlery which was surprisingly lacking for a party of 6. We got off to a bad start, with a cold house and overflowing water tank, but this was swiftly attended to, and a lovely plumber came in the evening. .
Our second visit to Park House and we will be back ! A fantastic cottage with easy access to the village and fabulous walks from the front door. We had a very relaxing week in beautiful surroundings. The cottage is to a very high standard of decor. The welcome pack on arrival which contained a good selection of basic and luxurious items and not expected, was a nice touch. The wood burning stove in January made for a very cosy atmosphere. Would highly recommend to anyone who wants to ‘get away from it all’. Lovely walks locally and the beautiful Lake District within 30 minutes drive West and the Yorkshire Dales on the doorstep to the East. The Barbon Inn within walking distance in the village provided a warm welcome and lovely food. The cottage was ok . I stayed in the box tree last year and found it cleaner. The welcome pack at the box tree was better with coffee and butter included. The cottage is very hard to find and single track roads which would be treacherous if it snows. No good for disabled people. Booked 6 nights for a birthday break. Stunning location and an excellent property. Great service from start to finish. Would recommend the Barbon Inn for food and atmosphere and the Churchmouse especially for their Friday night Bistro but booking is essential. Negatives: no tumble dryer, heating inadequate, narrow lanes ..
A wonderful property, well equipped and immaculately furnished. The location is perfect for local walks or easy access the Lakes and or Dales. Would highly recommend. Thoroughly enjoyed our stay. The house is beautiful. Will be back again in the future and will recommend Millhouse Cottages to friends and family. The property is beautiful, The interior styling and facilities are spot-on..you feel as if you have walked into a Sunday Magazine country cottages photo shoot. Location is excellent too - just a 5-10 minute gentle walk into Barbon with its local pub/restaurant and village shop. Great place to stay for 3 adult couples. We returned for our second stay at park house cottage and once again had the most wonderful time. The cottage is well laid out, with lovely fittings and furnishings , modern yet homely. The setting is absolutely gorgeous , amazing views all around. Great choice of local restaurants and fabulous walks .Can not recommend highly enough !Would benefit from having tumble drier! Comfortable cottage, in great location with amazing views! I would say peace and tranquility describes the location of the cottage. Other benefits are that the cottage is beautifully furnished, comfortable and well equipped (perhaps some hooks on back of bedroom and bathroom doors would be helpful though). Another bonus is that there is a great pub, The Barbon Inn just a ten minute walk away. Six of us have a cottage break every year and thus has scored the highest!! Thank you. This cottage is set in the perfect location. 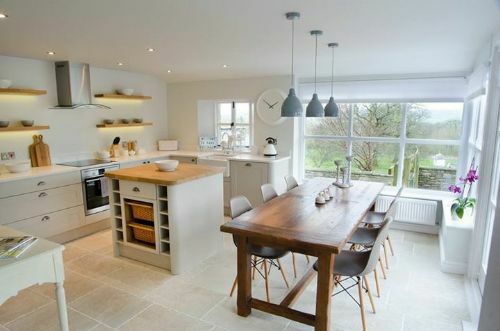 It is around 10 minutes away from Kirkby Lonsdale which has local shops, restaurants and a supermarket, the short drive to the cottage takes you to a beautiful country setting surrounded by fields. The cottage itself is beautifully decorated and the facilities (kitchen/bathrooms/log fire) are great. The welcome hamper is a nice touch too. A fantastic cottage in a beautiful location. We would definitely use Mill House Cottages again and not hesitate to recommend to families and friends. Park House Cottage has all the charm and comfort needed for a wonderful stay. Beautifully decorated and spacious, it has fulfilled all its promise. We will certainly try to return to the area shortly. A beautiful cottage with quality fittings, furniture and decoration set in a lovely location. Well deserved 5 star rating. Local pub served good quality food. Both the cottage and the pub are dog friendly. We have stayed with Mill House Cottages many times before and have always found them to be excellent in terms of both decor and location but this cottage is something really special. Superb location with stunning views and tastefully decorated throughout. Perfect for a relaxing break. We will most certainly be returning to Park House again and again. We knew you would love it ! As you say, Park House is really special. We are delighted that you had a fantastic stay. A perfect cottage for a relaxing break with just the sheep for company. Kirkby Lonsdale which is nearby was a delightful little town with unique small shops. The lake district is within easy reach but so many people! !